Lighting is without doubt one of the most important and often overlooked areas when creating your event or party. 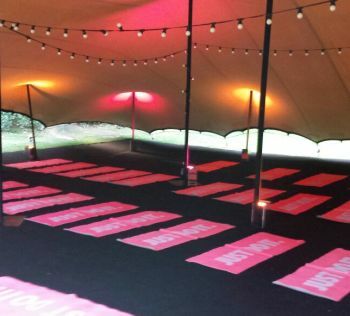 As you will see from the image galleries on the ‘our stretch tents‘ page creative lighting bring stretch tents to life. 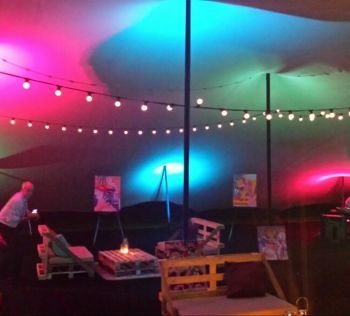 Stretch tents make the perfect canvas for lighting whether inside or out. It is a key factor in crafting the look and ambience of your space. Our lighting designer will work with you to create a lighting plan to suit not only your vision but also your budget. Stretch tents react wonderfully to light with their stretched ‘light permeable’ membrane. When coupled with the architectural lighting of gardens and grounds, the results can be spectacular. We can supply everything from cordless GDS up-lighters to festoon lights, fairy lights or even sky-trackers. We will make sure your tent looks amazing day or night. Cordless GDS up-lighters provide 49 different pre-set colours that can be set up to rotate through a number of colours. They come in a chargeable flight case, which means that the units are completely wireless. With the light being projected up, rather than down these powerful long charge lights are ideal for all events. Perfect for lighting tents, gardens, buildings or trees. 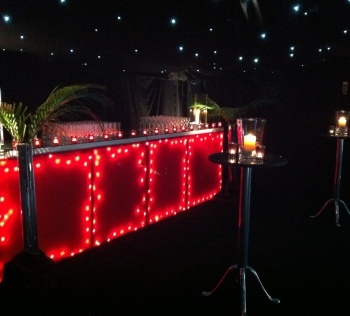 Festoon lights come in 15 metre sections which can be easily set up within the stretch tent or around the perimeter. These traditional bulb lights provide excellent lighting and can be used with a variety of lanterns or bulb colours. Their golf-ball size bulbs provide excellent illumination, and look great when strung up in a tent or a tree. Fairly lights always bring a touch of the magical to anywhere they are strung. 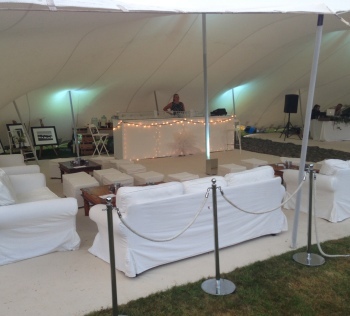 When arranged correctly, they can bring out the enchantment of any space and create a whole new feel to the stretch tent. 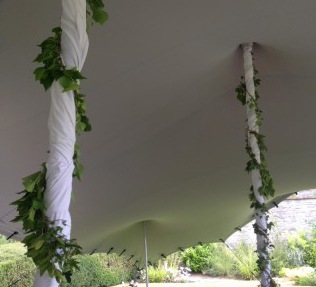 Their flexible nature makes them easy to wrap around ropes or poles or just the tent edges. Sky Trackers are essentially large spotlights that track through the night’s sky. They look great when paired with a large event tent.